Sure, we give our patients a trusty toothbrush when they visit our Newton offices. But we’d be happy to give up that, and maybe give you more floss instead. It’s not that we don’t love the toothbrush and want you to brush for two minutes twice each day. It’s that we’d like you to switch to an electric toothbrush. This isn’t some novelty item that only adds to the plethora of gadgets most people feel the need to waste money on. Electric toothbrushes simply make sense for most patients as a tool for better home hygiene. And don’t take our word for it — in September of last year, the American Dental Association gave their seal of approval to five Braun Oral-B Oscillating-Rotating-Pulsating Power Toothbrushes. Why is an electric toothbrush better? Electric toothbrushes, by their very nature, do the work for you. You place the brush head on your teeth and gums and let it get to work. Many of these toothbrushes have a built-in timer that tells you when you’ve been brushing for two minutes, the length of time recommended by the ADA. Basically, all you need do is move the head from tooth to tooth and it will remove the plaque from your teeth. The goal is to be a thorough brusher, and many people are any but that. Because the heads rotate or otherwise move, the odds of doing a better job than your hand and arm are heavily weighted in favor of electric toothbrushes. If you’re a very diligent brusher, you may get every tooth brushed and hit your gums. But not many people ever brush for the full two minutes recommended. The problem with some even good manual brushers is they can be too aggressive. This can lead to gum recession. Here are some specific cases where electric toothbrushes are a no-brainer. If you’re a haphazard, cursory brusher— You know who you are. You brush your teeth but are lackadaisical about it. You could easily leave a tooth here or there with plaque on it. If you’re a kid— Little kids love electric toothbrushes because they’re fun gadgets. Some think they tickle their teeth. Once you explain to place the brush head on each tooth, they’ll do a good job brushing. Also, kids with traditional braces benefit mightily from electric brushes because of their thoroughness. If you’re elderly— As we age, many of us have some dexterity issues with our hands and fingers. Electric brushes don’t require any hand or finger dexterity. Still on the fence about going electric? How about a couple telling statistics? Your hand and arm can produce around 200 strokes per minute with your manual toothbrush. 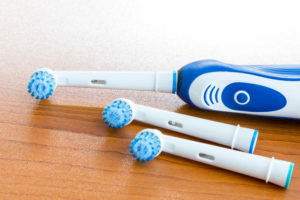 An electric toothbrush generates 30,000 strokes per minute. Which do you think will clean better? Want research? Toothbrush maker Braun Oral-B had dentists and hygienists ask 16,000 patients to use an Oral-B electric toothbrush from one visit to the next. When asked to monitor how their patients’ teeth looked afterwards, the dental professionals said the electric toothbrush had a positive effect on the oral health of over 80 percent of the patients. This isn’t an advertisement for Oral-B electric toothbrushes. They’ve provided research and the ADA just approved them. However, any reputable electric toothbrush company, such as Phillips, will make an electric option that works better than your manual toothbrush. If you have any questions about electric toothbrushes, ask the team at Cosmetic Dentistry Center. Call us at (617) 965-7673. Is Dry Mouth a Thing?